- EUR has formed a support base at 1.13 says Societe Generale. - Advocates using currency options to profit from eventual recovery. - As MUFG downgrades EUR forecasts, but still also projects recovery. The Euro has carved out a firm floor of support following months of losses, according to analysts at Societe Generale, who advocated Monday that clients use FX options to profit from an eventual recovery by the single currency. 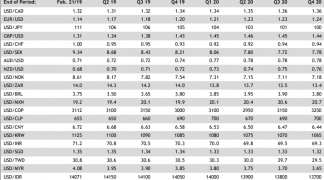 Societe Generale's trade idea comes closely behind the latest currency outlook from Japanese lender MUFG, one of the world's top five by assets, which saw the analysts at the bank downgrade their forecasts for the single currency but otherwise continue to predict a steady recovery over coming the quarters. Both views come after a week where poor economic and political news forced the Euro back to a one-year low against the Dollar, taking its 2018 loss across the 5% threshold, rendering it even larger than the decline seen by a Brexit-stricken Pound Sterling. "EUR/USD price action is going through decisive times. While the FX rate is still within its range, our technical analysts suggest that, in revisiting August lows of 1.13/1.1270 (also the multiyear trend support), it could be forming a potential double bottom, highlighting those levels as a crucial support," says Olivier Korber, a strategist at Societe Generale. Korber has advocated that clients of the bank use FX options, a complex kind of financial derivative, in order to take advantage of an eventual recovery by the exchange rate. The structure he's recommended will pay investors a return once the exchange rate moves back inside the 1.1500 to 1.1650 range, although investors will lose from the trade if the market price falls to 1.1250 at any point, suggesting Korber and the Societe Generale team do not believe the exchange rate will set new lows. 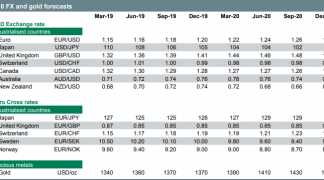 "The risk of further dollar gains remains a concern, as the US mid-term elections and the G20 meeting are going to deliver information not yet fully discounted in market prices. However, the current technical configuration suggests trading via options the conditional scenario whereby the EUR/USD met its floor last week," Korber says. The Euro-to-Dollar rate fell to its joint lowest level since the middle of 2017 last week after strong economic data helped the Dollar back onto its front foot at a time when the economic and political outlook for the Eurozone has darkened again. Amid a blistering confrontation between Italy and the EU over the former's budget, losses in domestic regional elections saw Chancellor Angela Merkel, a stalwart of establishment stability in Europe, announced she would not seek re-election as the chair of Germany's Christian Democratic Union or as Chancellor next time around. Chancellor Merke's resignation came amid a flurry of poor German economic numbers and just days before official data revealed that the Eurozone economy slowed sharply during the third-quarter, with GDP expanding just 0.2% when the market and European Central Bank had hoped to see it rise 0.4%. 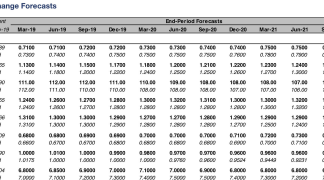 This, as well as rampantly strong Dollar, compelled the currency team at Japan's MUFG to downgrade their forecasts for the EUR/USD rate over coming quarters at the beginning of November. But even they are still projecting a steady recovery from here onward. "Despite this data and other sentiment readings worsening (IFO, ZEW), the ECB chose at its meeting in October to maintain a broadly consistent message of economic risks remaining balanced and broad economic conditions remaining consistent with their objective of price stability," says Lee Hardman, a currency analyst at MUFG. "But the financial market response to the ECB’s maintained view of the economic outlook suggests a degree of scepticism." The Euro's appeal to investors is hinged on the European Central Bank ending its quantitative easing programme in December and, once "through the summer of 2019", beginning to lift its interest rate. However, both of these require inflation to remain on track for a "sustainable return" toward its target of "close to but below 2%", which itself requires the economy to continue growing at a decent clip. MUFG's Hardman says the bank's forecast of a steeper recovery by the EUR/USD rate was always contingent on markets becoming more confident about a 2019 Eurozone interest rate rise being delivered as year-end approaches, not less. And in an environment where economic growth is falling, markets are only likely to become more pessimistic in their outlook. "As a result of these factors, we have now lowered our forecast projections. 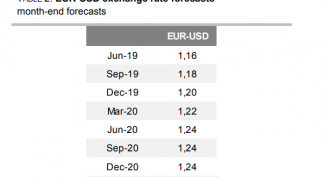 We have revised the entire EUR/USD forecast profile lower by between 4-5 big figures but have maintained the upward profile given we still expect some narrowing of the wide macro divergence between the euro-zone and the US in 2019," Hardman writes, in MUFG's monthly currency outlook. Despite the downgrade, Hardman and the MUFG team are still projecting a steady recovery by the exchange rate over coming quarters, although their forecasts suggest the Euro will not make it to the levels hoped for by Societe Generale's Korber until the early stages of 2019. They project the Euro-to-Dollar rate will end 2018 at 1.14 and that it will rise to 1.16 by March 2019, before climbing to 1.20 in the summer months. These are downgrades from earlier projections of 1.18, 1.20 and 1.25 respectively. The Euro was quoted 0.11% higher at 1.1396 Monday but had fallen by -4.9% for 2018 as of the London close.